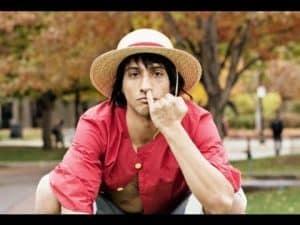 These One Piece Cosplay ideas are sure to help you decide who you want to cosplay as. With hundreds of episodes one piece is a binge worthy anime series to keep you cozy all winter! 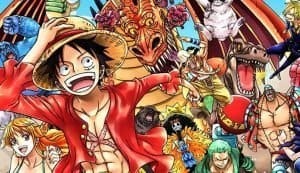 Luffy is the main character of the anime series and he is a pirate! Luffy is searching for the worlds greatest treasure called One Piece. There are these special fruit in the world called devil fruit after eating them they give you special power. Working to assemble a awesome pirate crew we get to see the characters of the show develop and how unique each one is! Good old fire fist ace! 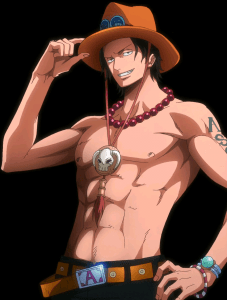 The 2nd most popular character in One Piece, Ace has the ability to conjure and become fire thanks to the flame flame fruit. When dressing up as Ace you will notice he has a lot of accessories and his weapon on his hip. This is another reason why this costume is a fun one to wear. Another skinny pirate Ace is about 3 years older than Luffy. The overall costume is not that complicated blank pants and a orange belt with the letter A on it. A lot of people tend to make the smaller items themselves since it can save you a lot of money. Craft stores will have most material needed to create any bracelet or arm bands like the one on his elbow. 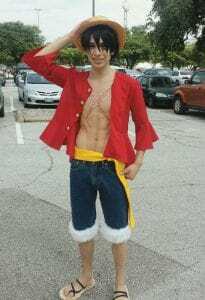 As the main character of the anime Luffy cosplay is the most popular from this anime series. 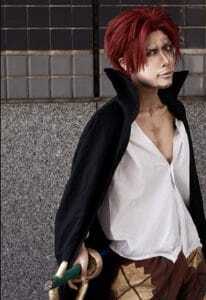 Both male and females enjoy taking part cosplaying as him. 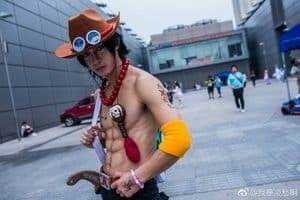 Every anime character has a special ability and Luffy is no different after eating the devil fruit his body is now like rubber! 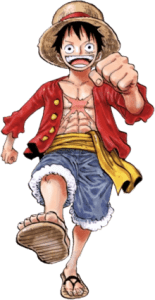 Some main cosplay ideas for Luffy are his hat, red shirt, sandals and jeans shorts with the white fuzz. For the most part this is a easy costume to pull of the hardest might be having the body type hes so skinny! These are 3 different people doing Luffy one being female which is awesome. The middle guy really went all out and has the X shape scar on his chest as well it looks awesome. The guy on the far right seems to have a store bought costume and it looks good. He also forgot to wear his sandals and the white on the jeans doesn’t look to fuzzy. Everyone has their own take on a costume which is why it is so fun to see what people come up with. This is a really funny pose of luffy picking his nose haha it is just like in the anime. I really like the red shirt that he always wears not only does it stand out and catch your eye. But it also represents so much more the color red stands for strength, energy, passion and it is a very emotional color. Perona is a interesting character she is a spoiled brat who acts childish and immature. Its funny that she has a obsession for cute things and everyone that works for her have to be cute as well. She has the power to control zombies so imagine a zombie army of everything cute haha. 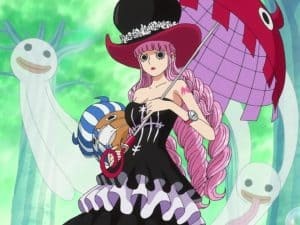 Since Perona has a few different outfits in the anime series I can see how it appeals to a lot of female cosplayers. This cosplay version is a lot darker with the umbrella, black top hat and dress. The first dress has red at the end and red roses around the top hat which look better then the white in the 2nd picture. The ghosts in the picture really make it look more real and like Perona. This costume is not as popular as the next one from what I found online. 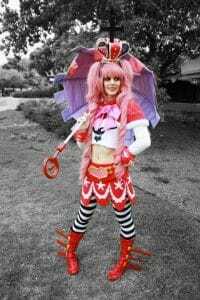 This is by far my favorite Perona costume with the stripped leggings that set off the costume. The pictures taken on the middle and right make it look like a graveyard or somewhere spooky. This is perfect for the ghost princess Perona and her zombie army! People sometimes create or buy the ghosts that usually follow Perona hanging them from the umbrella. This is a nice extra touch that people do to add the costume and to make it different at anime conventions. 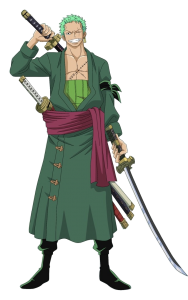 The unofficial vice president of Luffy’s straw hat crew Roronoa Zoro has the dream to become the best swordsmen in the world. Not only does he have a sword but 3 swords he takes up the job of a bounty hunter as well. 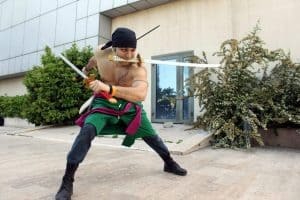 If you like swords then you must consider Roronoa Zoro cosplay for you. Here you can see him drinking a cold sake with the woods in the background. With the scar across the chest it adds to the costume, you can see one sword. In the 2nd picture he has all 3 swords attached to his side like the anime. With the red belt and drink in hand this really is a great photo. 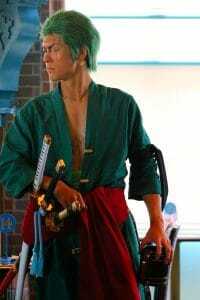 The last photo is of Roronoa Zoro in his combat pose ready for battle. Holding a sword in each hand and even one in his moth this is his style of sword fighting. 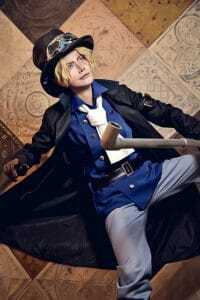 Sabo is one of Luffy’s childhood friends along with Ace who together made a pact to become amazing pirates! Always on the run from his parents he has a steam punk sorta look to him. 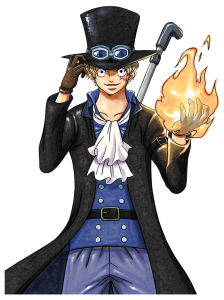 Like Ace, Sabo has the power of fire and a cool walking cane staff thing! 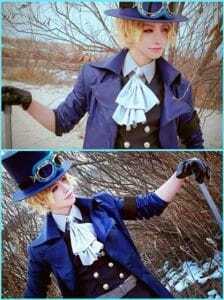 Taking a look at this one piece cosplay of Sabo it is quite a lot like a steam punk look. This costume features a black top hat with googles around it and a blonde wig. Unless you are willing to dye your hair blonde! A black trench coat and large walking staff that he carries on his back. So far these items are easy to come by if you want to make your own costume and not a store bought one. 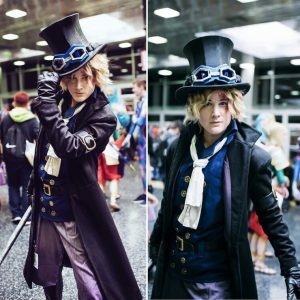 Most thrift stores have Sabo’s costume if you are willing to shop around your local city. A simple black belt and grey pants followed by the neck frill which can be made from cloth. As one of the most skilled chef’s in the One Piece world he is on a quest to find the blue water which has fish from all 4 seas. 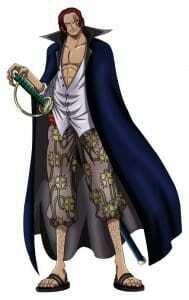 With his cooking he feeds the straw hat pirates and also knows black leg style fighting which is very strong. Using only legs to beat your opponent so your arms are safe for cooking later! Its also funny how both his eye brows are curly, also he has infatuation with women which can put him in a love struck daze. 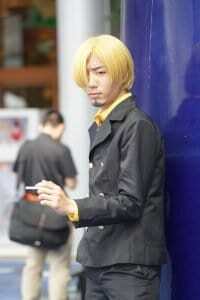 Sanji Cosplay is probably one of the most easy outfits to put together. A simple black suit with blonde wig or hair dye and you are pretty much there. Most people draw on they curl eye brows off the top of there own. Maybe pick your self up a fake smoke to put the costume together. 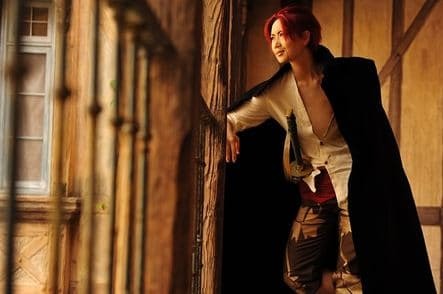 A powerful and well known pirate Shanks lost his arm while saving Luffy when he was a child. It is also said that Shanks actually knows what the One Piece actually is. He also carries a large sword which looks pretty cool like a saber. 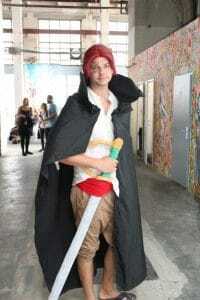 The most important part of this one piece cosplay costume is to make sure the sword looks real. Sandals, black cape and red wig are easy to pick up or some people even have in there collections all ready. The classic white pirate shirt and short pants are easy to put together from local shops. Stay away from a foam sword like the guy in the middle has you can see it really takes away from the overall look of the costume.